Lucy Punch leads the cast as Paige Britain in the West End transfer of Richard Bean’s new play, directed by Nicholas Hytner. Great Britain’s strictly limited run, booking to 10 January 2015, is designed by Tim Hatley, with video design by 59 Productions, lighting by Neil Austin, music by Grant Olding and sound by Paul Arditti. Richard Bean’s fast and furious new play is an anarchic and foul-mouthed satire about the press, the police and the political establishment. Paige Britain is the ambitious young news editor of The Free Press, a tabloid newspaper locked in a never-ending battle for more readers. 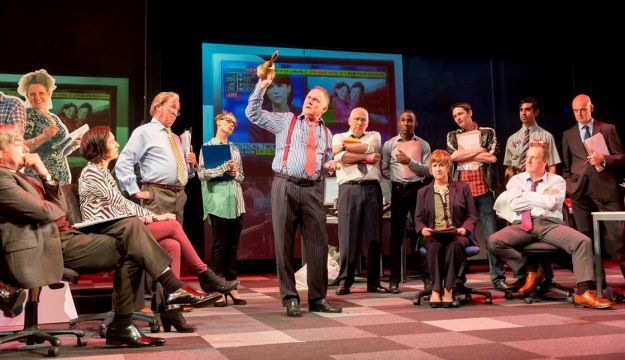 The West End cast comprises Sarah Annis, Ross Boatman, Robert Calvert, William Chubb, Dermot Crowley, Jo Dockery, Robert Glenister, Ian Hallard, James Harkness, Scott Karim, Barbara Kirby, Nicholas Lumley, Ben Mansfield, Maggie McCarthy, Iain Mitchell, Miles Mitchell, Aaron Neil, Lucy Punch, Nick Sampson, Kellie Shirley, Kiruna Stamell, Harriet Thorpe, Rupert Vansittart, Joseph Wilkins and Andrew Woodall. Great Britain received its world premiere at the National Theatre in June this year.